BACHAJON, Mexico (CNS) — Deacon Anselmo Hernandez received a call on a recent Saturday afternoon while walking down the main street of this indigenous community of Mexico’s southern Chiapas state, advising him of a neighbor who had died that afternoon. Within an hour, he had blessed the casket, led the family in prayers and read with them from the Bible. Communities such as Bachajon have come to depend on indigenous deacons like Hernandez, who play an important part in serving the church and evangelizing remote regions of Chiapas state. In the Diocese of San Cristobal de las Casas, priests’ services are in short supply and the mostly indigenous population — many speaking Mayan languages — has abandoned the Catholic Church in droves. Such is the shortage in Bachajon, set in the highlands region of Chiapas, that locals simply call indigenous deacons in times of need. The funeral Mass that Deacon Hernandez said would be celebrated the next day was unlikely to occur at all, according to the local priests at the Jesuit mission in Bachajon. The priests say carrying out church roles in the region would be unthinkable without the work of indigenous deacons, whose roles are not seen as subordinate to those of priests. A married father of 12 with “20 something” grandchildren, Hernandez is among the hundreds of indigenous deacons ordained by Bishop Samuel Ruiz Garcia of San Cristobal de las Casas, who died in 2011 and went about building an “autochthenous church,” in which indigenous population could express their faith in enculturated ways. That pastoral approach, promoted also as potentially alleviating the perennial shortage of priests, attracted unfavorable Vatican scrutiny and was banned almost immediately after Bishop Ruiz retired in 2000. 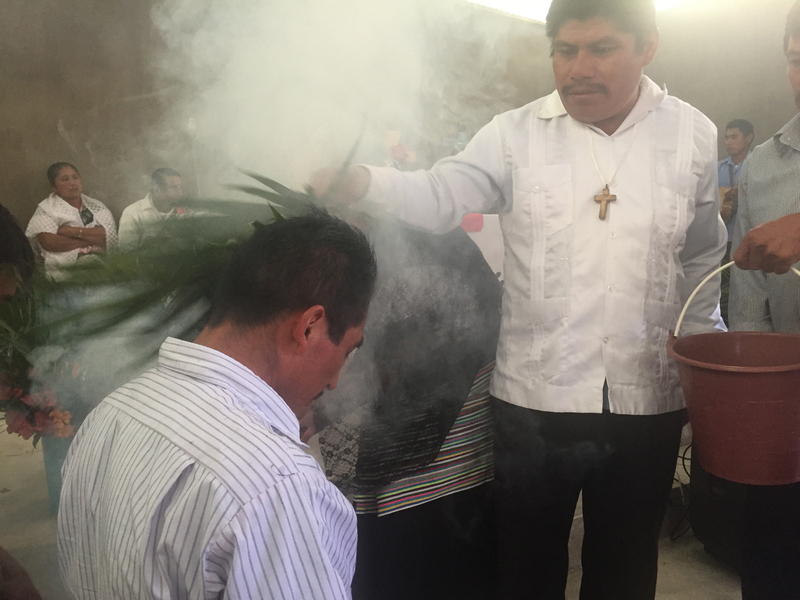 But with the election of Pope Francis, the ordination of indigenous deacons — all married — has resumed in rural Chiapas, while liturgical texts translated into Mayan languages also have been approved. Pope Francis visits San Cristobal de las Casa Feb. 15, where he will celebrate a Mass for indigenous people. Planners said he will read from Scripture and pray in Tzotzil and Tzeltal languages. The celebration also will include 300 indigenous deacons, including Deacon Hernandez, who will read from the Gospel of Matthew in Tzeltal. Proponents in the diocese see the papal visit as a validation of their pastoral approach of incorporating indigenous communities into the church on their own terms. They also see a recognition of the legacy of Bishop Ruiz, whose practice of putting the poor and peripheral places at the center of his ministry offered an early example of the kind of church Pope Francis is promoting. “One of the reasons he is coming here is his realizing that because this diocese has not been appreciated as it should have been for the evangelization it has done,” said Jesuit Father Pedro Arriaga, diocesan spokesman. Bishop Ruiz’s pastoral approach brought a backlash in past years, especially in the Vatican. It also led to allegations it would bring about a more “deaconized” church — with more than 300 indigenous deacons at the time, more than half of the total number of deacons in Mexico — and opened the possibility of ordaining married priests. Bishop Ruiz’s successor, Bishop Felipe Arizmendi Equivel, “Obeyed Rome at all times,” Father Avilez said, and responded to the ban by recruiting more indigenous seminarians. Indigenous deacons continued working during the time of the ban, though their numbers thinned over the years, he said. But the model of celibate priest has its limits, according to Father Avilez. In Bachajon, six Jesuit priests, including three octogenarians, serve 600 settlements in a rugged region of winding roads and elevations topping 7,000 feet. The deacons celebrate Communion services every week in many settlements because the Jesuit priests are able to visit only every few months. Although the deacons cannot celebrate Mass, they are allowed to preside at weddings, perform baptisms and distribute the Eucharist. Bishop Ruiz did not start out with the idea of ordaining married, indigenous deacons — at least not in large numbers — but came to recognize the realities of serving a region with a majority indigenous population. Inspired by the Second Vatican Council, Ruiz took the church to the poor and in their own language, angering the business and political classes, which had previously received the bishop’s blessing for their activities. He trained catechist instructors, who became the first married, indigenous deacons, and adopted the idea the local church should incorporate cultures of indigenous peoples, not just baptize their babies. “Every place has its own way of experiencing the church and here Don Samuel and the indigenous requested the right to live their faith in accordance with their culture and identity,” Father Ituarte said. “If the people are Tzeltal and speak Tzeltal, the Gospel should be in Tzeltal and be experienced as Tzeltales and they shouldn’t have to become culturally mestizo to be Catholics,” he said. Parts of the program proved controversial outside the diocese, however. Communities chose their candidates, who must show a history of active church service. They then receive training and study theology for several years. The men must be married, an important consideration in indigenous communities for authority figures. “In the local context, Don Samuel understood that the priesthood has to be an enculturated priesthood and this implied married priests. This is the core problem for many,” Father Ituarte said. With no new ordinations for 14 years, the number of indigenous deacons has diminished, keeping Hernandez busy. “I have not time for my ‘milpa,'” he says of his corn-growing plot. Mostly, he visits the sick and distributes communion in communities of coffee growers, where priests sporadically pay visits. The services are spoken in indigenous languages and include homilies, singing, prayer and the laying on of hands. Blessings are offered and Communion given — with hosts blessed by priests and brought to “Ermitas,” places of worship in the indigenous communities. it’s about time…the church allows…married priests!!! our desciples were our first christian priests and they were married!!! including our first dear pope…st.peter!!! celibacy should be made….”optional”. for that is what God wants and needs,,,family priests!!! for jesus himself chose..married followers…not…single desciples!!! mandatory celibacy has ruined our church…thank God…for our pope francis…having an opened mind and heart…for bringing in…again…back to its’ original roots!!! ”married priests”!!!! and then we will have many good priests…again!!!! thank you and blessings!!! !